Anonymous hacktivists initiate various operations which are support by activists and hacktivists. To make it easier, we have published a ‘Anonymous Operation Template’ which will allow you to attract more attention to your Anonymous Operation. The Anonymous Operation Template is free to use. 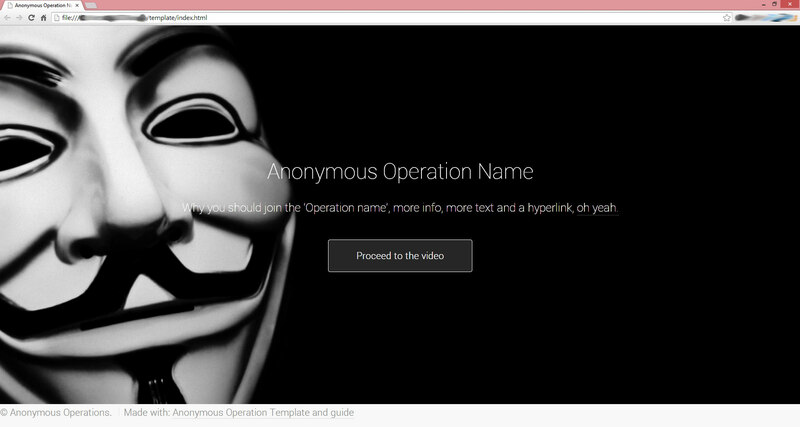 You can download the Anonymous Operation Template to your computer, so you will be able to edit the template. The template is very simple, so it will allow you to spread your Anonymous message very fast. Each website on the internet has a ‘Page title’. In this section you will need to provide the operation name. This will allow it to be indexed by Google, Yahoo and Bing. It is important to provide a clear description of your Anonymous operation. Do not overkill the message. Be direct and provide valuable sources in the Youtube video section. Each successful Anonymous operation had a youtube video. Publish your video on Youtube and provide various links which will support your Anonymous operation. Simply open the Index.html file with your Text Editor (Notepad.exe). This will allow you to change the text of the Anonymous template.